Just because you’re cutting back on sugar, it doesn’t mean you have to toss it in the garbage. There’s so much more you can do with sugar — other than eat it, of course. 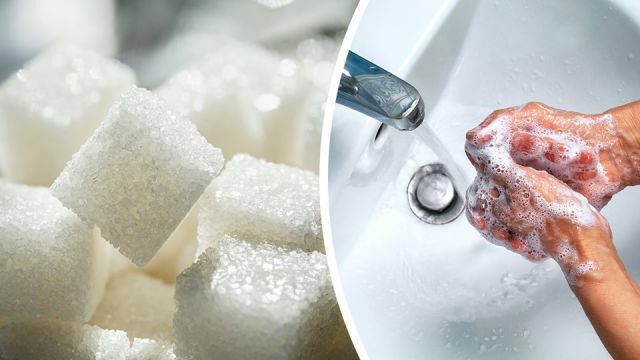 From exfoliating your body to removing nasty stains and odors, here’s nine ways to use sugar on your body and in your home. Coffee grinders, filled with stale odors from old coffee grounds are notoriously hard to clean. But sugar makes cleaning your coffee grinder easy. That’s because sugar absorbs flavor and odors that reside in your grinder. Sugar is especially useful when using your grinder for grinding spices. Simply pour about a 1/4 cup of sugar into your grinder like you would coffee beans. Now grind for a few minutes. Pour out sugar and rinse with warm water. You can also take a damp cloth to remove excess sugar. Your next pot of coffee with be fresher and tastier. Use sugar to remove odors in thermoses and plastic containers. Just add about a teaspoon of sugar into the container and seal tightly. Rinse before use; any unpleasant odors with be gone! Mix all ingredients together and store in an airtight jar. Use 1 to 2 tablespoons as needed in the shower. Scrub skin in gentle circular motion, and rinse will. Your skin will be soft and smooth! While you’re at it, why not create a sugar scrub to slough away dead skin on dry, chapped lips. Simply mix equal amounts of sugar and coconut oil to form a paste. Apply the sugar mixture on your lips and allow it sit for 30 seconds. Wipe it off with a damp cloth. If you’re a rough and tumble kind of guy or girl, or if you have kids that frequently come home with grass stains on their clothes and shoes, then sugar is the answer to removing those unsightly stains. To remove stains, mix equal parts of warm water with sugar to form a paste. Rub the sugar paste over the grass stain and allow it to sit for about an hour. Then wash your clothes, as per usual, with your regular detergent. This works particularly well on multicolored fabrics that you wouldn’t dream of bleaching. Sugar is a natural for absorbing nasty odors and even moisture that causes mold on cheese. Just add a few sugar cubes into an airtight container with your cheese. It also works well to stop mold from forming on bread. Yes, you can use sugar to treat wounds and cure painful infections. Treating wounds with sugar has been a wives’ tale for years but now medical evidence proves that it works. Although salt is painful on open wounds, sugar is not. In fact, it reduces pain and is proven to be just as effective as conventional medicine according to researchers from Selly Oak Hospital, Birmingham, as reported by Daily Mail. Researchers used granulated sugar on bed sores, leg ulcers and amputations before dressing the wounds and found that it killed bacteria that prevents healing and causes chronic pain. Bacteria needs water to survive but sugar actually draws water from the wound into the dressing. According to a study from Beit Cure International Hospital, 72 percent of patients treated with sugar between dressings experienced no pain. Honey was even more effective, with 86 percent of patients experiencing no pain. For people who regularly work on cars, sugar offers a quick solution to degrease hands. Instead of chemically-laden grease removers mix sugar and liquid soap in the palm of hands and rub together. The exfoliating power of sugar will remove grease and leave hands soft. Sugar is also ideal for removing odors like fish, onions and garlic from the hands. Simply pour one tablespoon of sugar into your palm. Add about a teaspoon of liquid soap and rub hands together. Rinse with warm water. Hands will be clean and odor-free in no time. There you have it, some great ways to use sugar around your home and on your body. Just don’t eat it! Hey Buddy!, I found this information for you: "9 Things To Do With White Sugar Instead Of Eating It". Here is the website link: https://www.thealternativedaily.com/9-things-white-sugar-instead-eating/. Thank you.